When Christian missionaries embark on “the Great Commission”—to “make disciples of all nations, baptizing them in the name of the Father and of the Son and of the Holy Spirit” (Matthew 28:19)— they bring their personal effects, their preparation, and their faith. What they bring home depends on their journeys, especially the people they meet along the way. 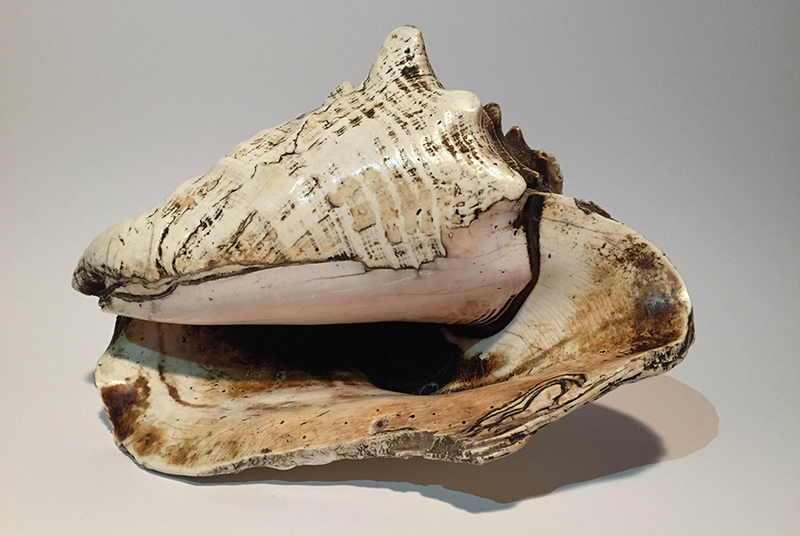 The conch shell used by David Brainerd to call Native Americans to worship. American Presbyterians have served in mission fields since the 18th century. Over time their work has changed dramatically, from focusing on spiritual conversion to working collaboratively with native populations in areas such as education and public health. The artifacts featured in this exhibit reflect the experiences of missionaries who lived alongside unique and varied communities from the 1740s into the 1980s—throughout the Americas and overseas. If the past is truly another country, these pieces conjure a world. Ordinary items with special significance: a conch shell from Colonial America, a flip-flop from Lebanon, moveable type from Oregon Territory, a sewing box from Idaho Territory. Art objects that reveal their creators’ inventiveness: dancing bells from West Africa, a wedding box from the Congo, handmade dolls from Venezuela, match box models from Japan. As you explore “Journeys of Faith,” we invite you to wonder what tomorrow’s missionaries might bring back to the society—from other continents or your hometown.